This one named after winemaker Marnie Roberts’ grandfather. 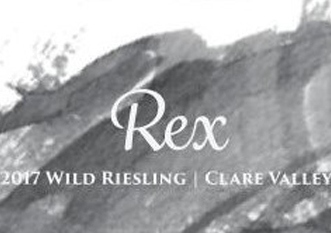 Now, normally Clare Valley Riesling is such a precise, pure thing that invokes such descriptors as “laser like” and “diamond edged.” However, Marnie’s not seeing Rex in such a clear light. I don’t think she’ll be run out of the valley, but foot stomping, 7 days on skins and a little oak maturation aren’t the usual riesling processes for the Clare. Wild riesling indeed. Carries a cloudy hue. Slightly nutty aromas with a touch of browning apple alongside green apple, grilled limes, steel, mandarin citrus, floral talcy bath bombs and brown spice. Juxtaposition on the palate: rounded yet crunchy. Green apples and limes. A powerful food match: give it a heavy Asian chilli pork or kung pao chicken. Thanks Stuart. I use the 20pt scale as based on wine show judging system. We could just as well “score” wines using a 5 star system, out of 10 or 100 or arbitrarily out of 9 aubergines. For mine…is 91/92 out of 100 points that different? However, I see that there is a marked difference between 17 and 18 points in this scale. You’ve inspired me though and I’ll put an update to the site with this explained. And we all use the various scoring methods differently anyway. There’s a good guide/graphic I found on Jancis’ site showing how her 20 differs to Wine Spectator, aligns to Parker’s 100. I prefer pictures. Like Brookesey’s naked squaw riding a horse for some tip top murky substance he liked. My point really being: I liked your words. Big thanks for the feedback, always an evolution!